FIAT 500 Custom Wheels by Team Dynamics - Light Alloy Wheels "Pro Race 1.2" in a Custom Hyper Silver Finish 15"
One of the biggest selling designs is now available for the FIAT 500. Team Dynamics Pro Race 1.2 wheels are some of the lightest and strongest wheels on the market that are available for your FIAT 500. These wheels look fantastic on the FIAT 500. We offer these wheels in the correct 4x98 bolt pattern (not 4x100 that others offer). The Pro Race 1.2 is one of the most recent designs in the Team Dynamics Racing Range. These wheels are cast aluminum and heat-treated. The wheels were originally designed for motorsport use. They are still one of the favorite wheels for those that like to take their car on the track. Now these wheels have been made available for street use and due to our relationship with Team Dynamics we have convinced them to make a version available for the FIAT 500. A small quantity of these wheels have been imported from the UK and are no in stock in our warehouse. 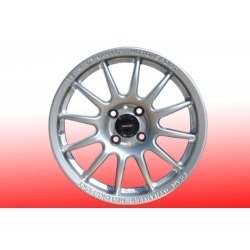 The 1.2 is a classic motorsport design with 12 spokes and molded in Team Dynamics logo around the outside rim. 4x98 - true 4x98, not a 4x100! This listing is for a set of 4 wheels and caps. TEAM DYNAMICS warrants that wheels sold by TEAM DYNAMICS will be free from structural failure as long as the original retail purchaser owns the product TEAM DYNAMICS further warrants to the original purchaser that products sold by TEAM DYNAMICS will be free from defects in the material and workmanship under normal and intended use for a period of one year from the original date of purchase. This is a true 4x98 bolt pattern wheel set that has been designed to fit the FIAT 500. This is not a 4x100 set that some companies are trying to sell as a direct fit wheel. These wheel will fit the 500 without the use of "wobble bolts". When shopping for wheel please confirm that the wheels you are getting a true 4x98 bolt pattern (FIAT) and not the 4x100 (very common) that some are trying to pass as a direct bolt on replacement. All custom wheels that we offer are a true 4x98 bolt pattern and not 4x100 that have been adapted to fit. We have seen many wheels advertised elsewhere as a 4x98 when in reality they are 4x100 wheels with wobble bolts.